... is located two miles below Hamilton, North Carolina and 60 miles upriver of the town of Plymouth. Sitting 70 feet above a bend in the Roanoke River, this Confederate earthen fort provided a safe and clear view of Union gunboats approaching from down river. 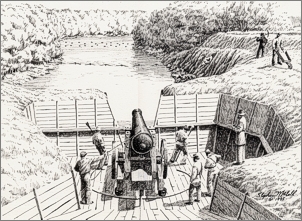 Eleven cannon offered significant protection for the railway bridge over the river at Weldon, a weak link in the "Lifeline of the Confederacy" between Wilmington, NC and Richmond, VA. The fort also protected the nearby construction site of the ironclad ram C.S.S. Albemarle which later helped regain control of the lower Roanoke River and Albemarle Sound by sinking wooden Union ships. Citizens of the entire Upper Roanoke Valley benefited from the fort, as well. Today, the site is the winter headquarters for the First North Carolina Volunteers, a Civil War re-enactment group. A battle re-enactment is held annually at the fort on the first weekend in November and includes a unique Living History Program. 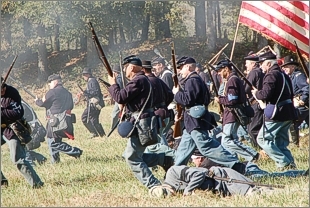 The annual events schedule often includes a springtime Living History Program and a unique Civil War Christmas celebration, as well. Visit the site and you can see eight of the fort's original cannon, making Fort Branch the only earthwork fortification in the South with its original artillery in place. You can also see a restored late 1800s steam engine from The Ranger, and local Native American pottery and artifacts from Hoggtown, a nearby eighteenth century river community. Other attractions include rebuilt gun emplacements and an 1850s farmhouse which is being restored. 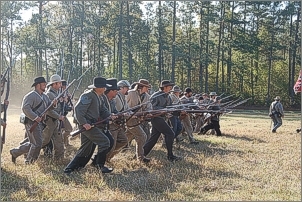 The Fort Branch Battlefield Commission works to preserve and restore the Fort and its heritage. Browse this web site to learn more about the history of Fort Branch and the ongoing preservation project. We invite you to visit during one of our events and to take part in supporting the fort's preservation. Fort Branch is located 3 miles southeast of Hamilton, N.C. Just off NC Hwy 125/903 at 2883 Fort Branch Road in Martin County on the Roanoke River. Fort Branch is open to the public on Saturdays from 1:30 to 5:30 pm beginning the first Saturday in April through the re-enactment weekend in November. Other times by appointment.